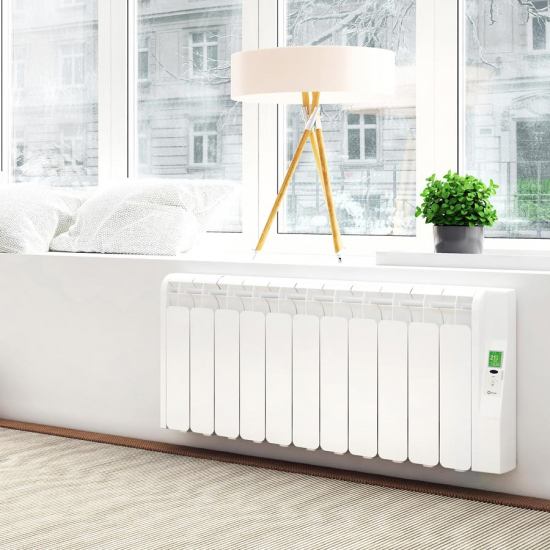 Download the manual for the Rointe Kyros Conservatory Radiator here. Installing the Rointe Kyros is a straightforward process that requires very little previous DIY experience. All necessary fixtures and fittings are included with the Kyros to help you get started. Use the template and the screws provided to mount the brackets to the wall, and then mount the radiator onto the brackets. The Kyros can then be plugged into the nearest 13A socket. We do not recommend electric radiators or panel heaters for bathroom installation. This is because there is the temptation to hang towels over the appliance to dry, which can obstruct ventilation on the heater and cause a hazard. Care must always be taken when connecting multiple radiators or heaters to avoid overloading the ring main of your property. If you are unsure, contact a qualified electrician for advice. For a professional installation, cables can be shortened and the heater connected to the mains supply by a fused spur. This work must be carried out by a qualified electrician. Rointe Kyros Radiators come with a 3 Year Manufacturer’s Warranty on the electronic components and a 20 Year Warranty on the radiator body. Rointe AIR Control Remotes come with a 2 Year Manufacturer’s Warranty. Rointe Kyros Electric Conservatory Radiators are available with free delivery. Please allow 3 – 4 working days for the item to arrive. Rointe AIR Control Remote Controls are available with free next working day delivery. Next working day delivery is available when you order before 12pm (excluding weekends). In the unlikely event that your Rointe products arrive damaged, any faults must be reported to us within 24 hours, otherwise an additional £12.50 charge will apply. The all new, third generation Rointe Kyros is a dedicated heating solution tailored specifically toward use in home conservatories. Kyros conservatory radiators combine intelligent control mechanisms with stylish design to create a functional and elegant heater that’s perfect for hard-to-heat conservatory spaces. These radiators’ low profile makes them ideal for installation on conservatory dwarf walls, where their longer length compensates for a slight reduction in height for maximum heat output. The new Kyros range uses thermal fluid technology for improved heat retention, allowing the radiators to draw less power from the wall to maintain temperatures while the Kyros’ unique vents help to circulate heat continuously, keeping the whole conservatory warm and inviting. The Kyros range is the perfect conservatory heating solution, operating entirely independently from your main home heating system. Kyros radiators can maintain temperatures within ±0.25°C and their ‘fuzzy logic controls’ work to prevent extreme temperature fluctuations that are more commonly associated with traditional heating systems. All Rointe heaters come with Open Window Detection: a feature that forces the radiators into Anti-Frost mode if they detect a rapid loss of temperature stemming from an open window or door. A new ‘user mode’ is also included with third generation Kyros radiators, allowing you to customise the temperature range and limit the radiators’ heat output – putting a stop to wasteful heating before it even starts! Kyros conservatory radiators also sport a new, easy to use graphic interface that allows you to access Rointe’s new ‘E-fficiency’ mode and keep an eye on your energy consumption. For quick, “at a glance” reference, the interface on the Kyros will change colour depending on its efficiency — green for efficient, yellow for average, and red for excessive. To maximise efficiency even further, the new Rointe Kyros range comes with a 24/7 heating programme that allows you to create a tailor-made heating schedule. Assign comfort and economy settings to hourly intervals or use one of Rointe’s adjustable pre-set schedules that reflect typical daily routines. To control your Kyros conservatory radiators from the comfort of an armchair, an optional remote control is also available. The Rointe AIR Control Remote has been ergonomically designed using fireproof, impact resistant polycarbonate that makes it both highly durable and comfortable to use. The 1.77” screen allows crystal clear viewing from any angle and its brightness can be adjusted to suit. The screen displays a clear view of all modes and active programmes, as well as the current time and the nominal and effective power of any product in the system. The wireless AIR Control Remote allows you to create your own heating programmes, set temperatures, and control every Rointe product with minimal input. The AIR Control Remote even comes with a control panel restriction option that prevents others from modifying already established programmes: the perfect solution for those with small children. Rointe AIR Control Remotes come in elegant white or modern black. The remote also comes with a sleek, transparent wall holder that will provide an unobtrusive means of storage. Simply mount it to your chosen wall and slot the remote in, so you’ll always know where to find and access your heating controls. Rointe Kyros conservatory radiators come in an elegant white finish and are constructed out of lightweight aluminium. Each Kyros comes with a 3 Year Manufacturer’s Warranty on the electrical components and a generous 20 Year Warranty on the radiator body. Please note: in the unlikely event that your Rointe products arrive damaged, any faults must be reported to us within 24 hours, otherwise an additional £12.50 charge will apply.